Backlogs – a buildup of overdue and incomplete joint use and other work requests – come in all varieties, from pole transfer backlogs to pileups of permits to attach, from unremedied NESC violations to mountains of detach notices. Think this could never happen in your organization? Think again. 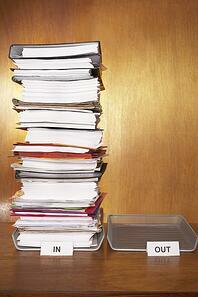 There are a host of everyday reasons backlogs can become the bane of your day, week or month. Today, we offer a quick rundown of the five biggest reasons you may find yourself with a backlog. Of the most common reasons backlogs can begin, weather is perhaps the most insidious and unpredictable. Wind, rain, snow, hail, fire, tornadoes and hurricanes can down poles by the dozens inside a small radius, leaving pole owners and attachers with a lot of repair work – and a lot of requests for pole transfer and attachment – all coming in a short period of time. This can seriously tax internal resources; with so much to fix, common requests fall by the wayside in the hustle to restore service to customers. New developments can also create higher workload levels for organizations, as many poles and multiple pieces of equipment must be erected at once to satisfy demand in budding areas. Again, this backlog creator is related to resource contention: if staff is occupied elsewhere, requests can be put on the back burner. Growth in your community is a great thing. But, surprise! It can also mean a growing mountain of incomplete requests. In the joint use world, effective communication between attaching companies and pole owners can mean the difference between transfers requested and made in a timely manner and a mound of requests awaiting response. Each transfer request is governed by an attachment contract, which sets down the number of days within which transfers must be complete. But if an attacher never receives the request to move their equipment, when does the clock start? Using more effective communication tools – beyond emailed or mailed documents – can help connect the dots. As mentioned above, extenuating circumstances such as weather and expansion can thin your resources. Everyday "business as usual" tasks require time and effort and responsibilities add up over time. Consider assigning the project to an experienced external Joint Use Third Party Administrator. Calling in some additional expertise can hep lighten your load. Maybe you have never experienced a backlog – until now. Or maybe this is not your first time staring down a file of unfinished requests. If the latter is true, including follow-up processes that ensure all future requests are handled in accordance with contracts and compliance agreements can help organizations stay out of backlog territory and hopefully never find themselves working through excessively delayed requests again. Are backlogs the battle of your week? If so, now is the time to make a definitive plan for managing them through completion and preventing them in the future.